There is no denying Popcorn would be one of my favourite snacks! Unfortunately allot of the supermarket popcorn is laden with additives, preservatives, and extra saturated fat that we just don’t need. So I took it upon myself to perfect the ultimate cooking of popcorn at home! This way is so damn easy, even my partner can make it on his own!! Popcorn is in fact a whole grain and a great source of fibre. It’s such a great alternative to chips when you just want that ‘crunch’. Popcorn = The Wholesome Heart approved! So next time you want to nibble on something, Netflix and chill? 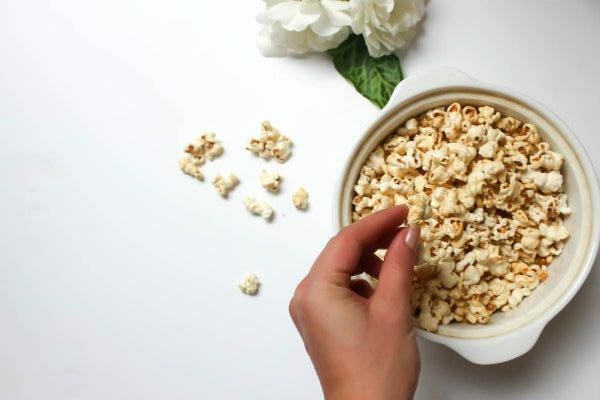 Don’t reach for the microwave popcorn, instead whip it up FRESH! Your tastebuds and your body will thank you later. Dressing of choice, Grass-fed Butter/Ghee, Salt etc. Heat a Medium sized saucepan, on medium heat. Add oil and 3 corn kernels, place lid on. Once the 3 kernels have popped, quickly remove them and add remaining corn kernels, place lid back on and swirl corn and oil. Leave covered until majority have popped. This should happen quite quickly as the oil and saucepan will be at optimal temperature. Remove and add dressings, and ENJOY THE BEST POPCORN EVER!